Just another snowman painting because … why not? Everyone loves a snowman. This is a Terrye French design from her 2003 painting book “Wintry Friends”. 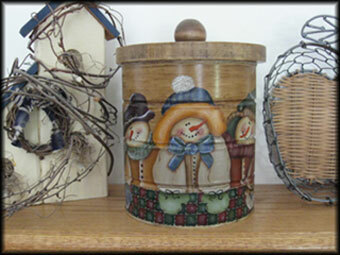 As durable rustic antiques, sap buckets have become a favorite media for craftspeople and can be used for all types of indoor and outdoor decor. This jolly snowman is soooo cute showing off his patriotic gingerbread men and skinny christmas tree. Til next time … Happy painting! 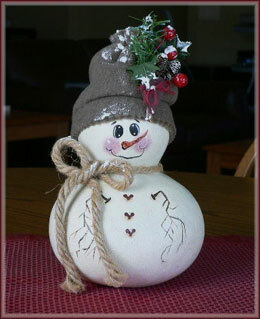 Coming next, What’s this … A gourd snowman! 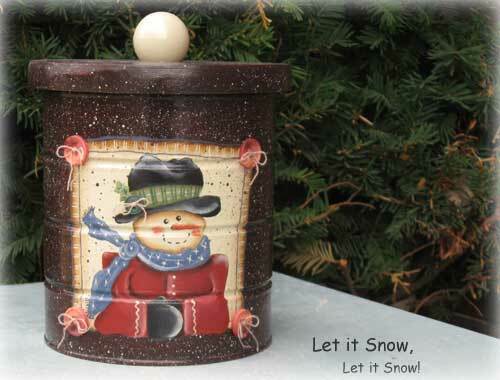 This entry was posted in Misc painted crafts and tagged hand painted, snowman, winter crafts on Tuesday, September 28, 2010 by Betty. I love these guys! This is a design by Terrye French and I painted them on a metal coffee can. The kind that is becoming antique. I finished them off with a wooden top that I made myself. So cute, and great to hold anything from cookies to hidden treasures. Hope you like it. Coming next, “Sap Bucket meets Snowman”. 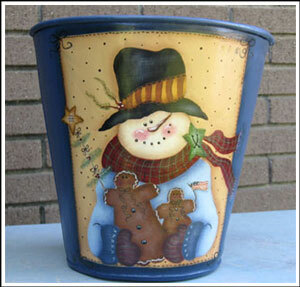 This entry was posted in Misc painted crafts and tagged hand painted, snowman, winter crafts on Wednesday, September 22, 2010 by Betty.